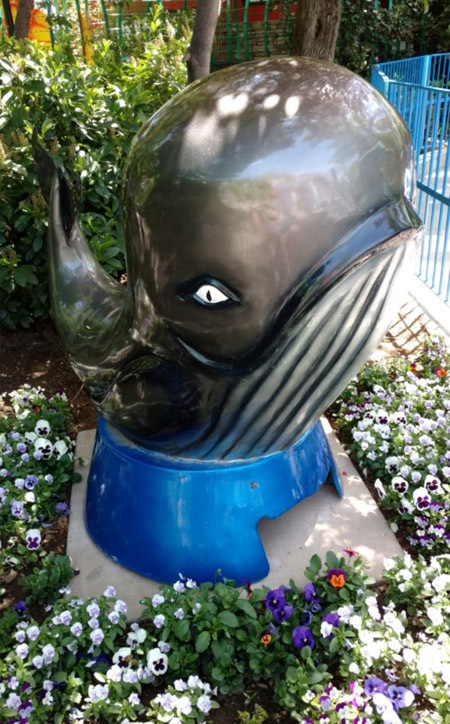 Bulgy The Whale was designed in 1948 by Johnny Waters – an engineer at Eyerly Aircraft. 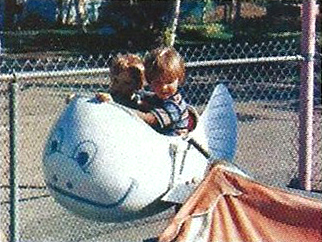 Little information is available about the early production of the ride, but articles in the trade paper The Billboard suggest Waters initially started his own company to make the ride. 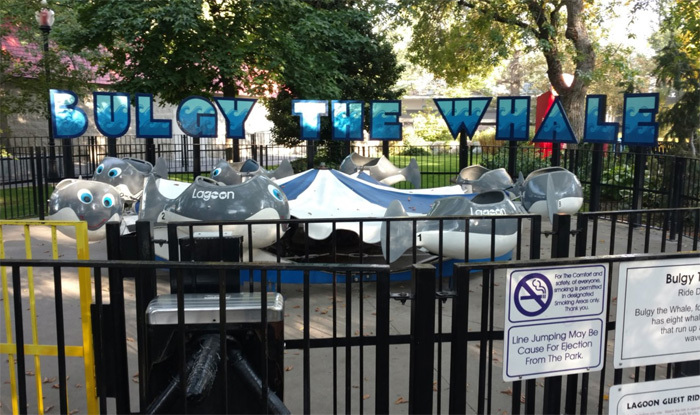 Ultimately Bulgy The Whale was manufactured by Eyerly, making it the company’s first kiddie ride. Until then, Eyerly was known for more daring attractions based on airplane maneuvers. 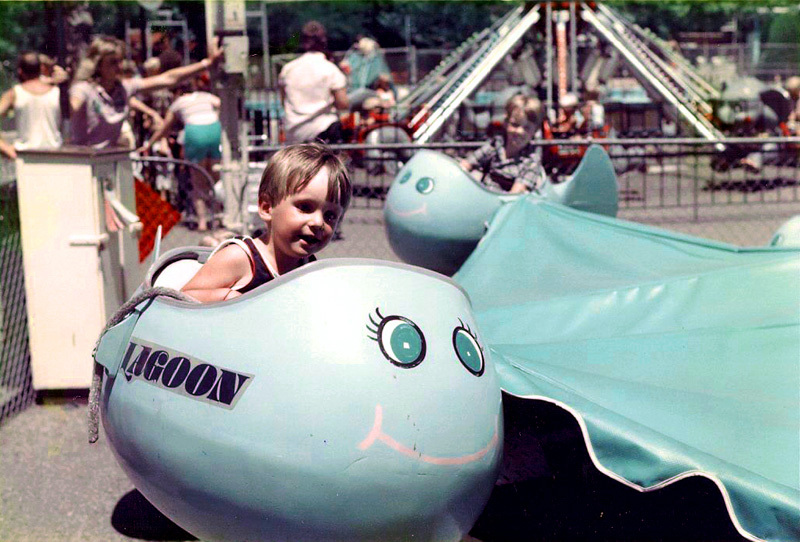 Lagoon’s Mother Gooseland area opened in 1956 and included Bulgy The Whale (making it the fourth Eyerly ride at Lagoon in addition to Rock-O-Plane, Roll-O-Plane and Octopus). 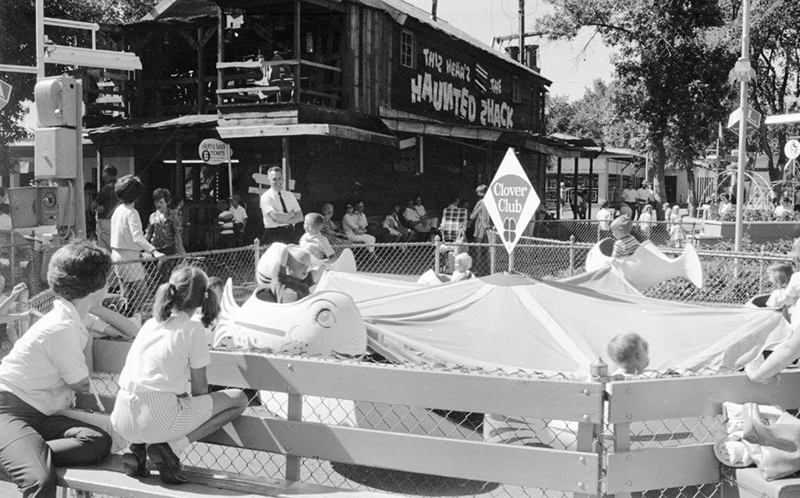 Bulgy’s first home at Lagoon was next to the Speedway. 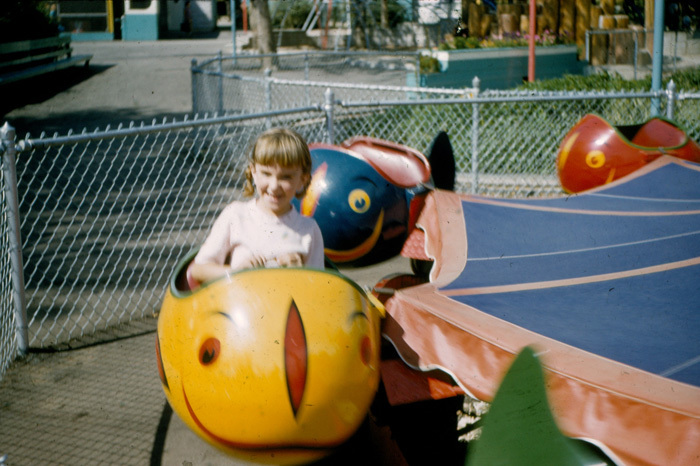 A photo from 1967 (below) shows a Clover Club sign on the ride. This very likely meant the ride was sponsored by the potato chip company based in Kaysville at the time. It’s possible other kiddie rides had different local sponsors as well. 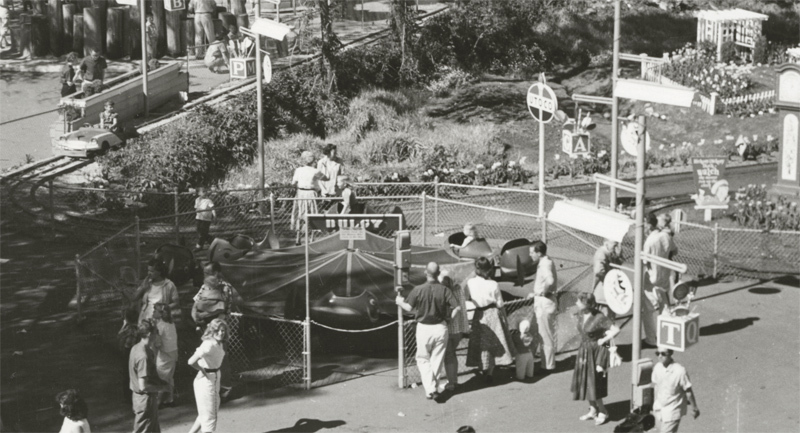 One known example is the Hi-Land Playland, which was a playground in the center of the Kiddie Coaster that featured a giant Hi-Land Dairy milk carton as the entrance. It was around the mid-’70s to early ’80s when this part of Mother Gooseland was reconfigured and Bulgy moved to its next location just a short distance to the north, next to the Swimming Pool (now Lagoon-A-Beach). Bulgy as shown in a 1978 Lagoon brochure. When Kontiki and The Dragonfly were added in 2004, Bulgy moved again to a spot on the east side of the Carousel Theater (where Sky Fighter is today). It was only in this third location for two seasons. 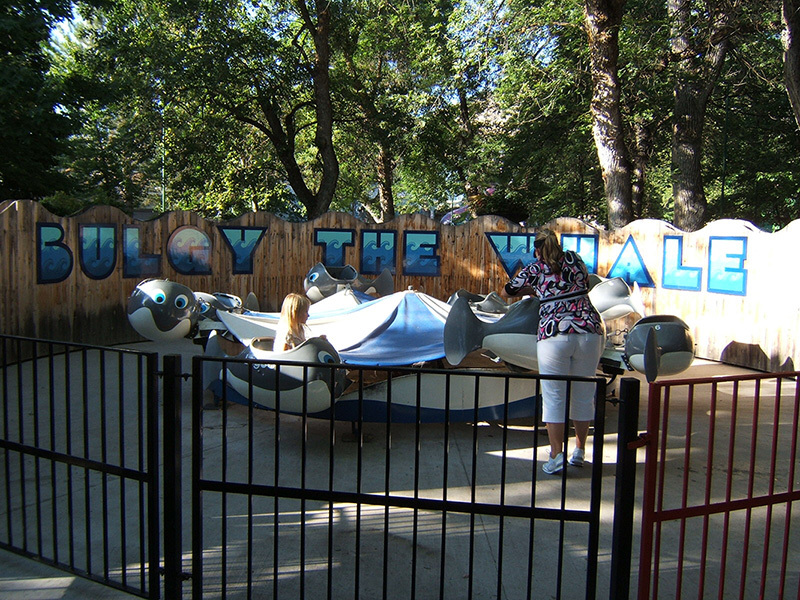 Next, a space was carved out for Bulgy near the entrance of the Putter Around The Park miniature golf course where it opened in 2006 with a wooden fence separating it from the course. Putter Around The Park was removed after 2008 and Bulgy was shifted northward a little to allow more room for pedestrian traffic. The wooden fence was taken down soon after. Over time, other rides were added to the old miniature golf site starting with Jumping Dragon in 2009, then Red Rock Rally and Tipsey Tea Cups in 2013. Two more were added in 2017 – Ruka Safari in the northwest corner and Flying Tigers taking Bulgy’s spot in the southwest corner. 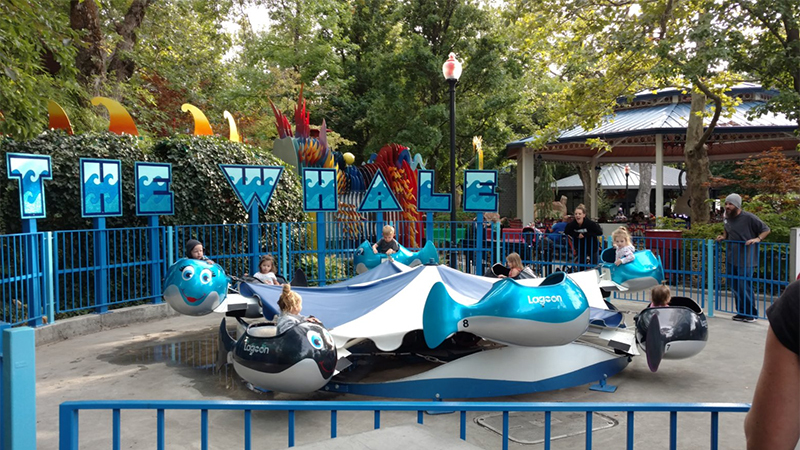 Now Bulgy resides behind Jumping Dragon, not far from another aquatic-style ride – OdySea. It has been repainted with all new fencing and a covered operator’s booth. The old Bulgy The Whale feature from Putter Around The Park has also been repainted and placed in a flower bed next to the ride. Coincidentally, it’s not far from where the Bulgy The Whale obstacle was located for the miniature golf course. As shown in the photos, the paint scheme has changed several times over the years. The original bright, multi-colored whales were all given the same light blue color and new faces in the early to mid-1960s. In the ’70s they seem to have been given new faces while retaining the same blue color. In the next decade they were turned into killer whales with a design closely resembling Shamu, the popular star of SeaWorld. It was probably around 2004 when the black and white scheme changed to grey and white. The new 2017 colors alternate between the killer whale style black and white and a sparkly, blue and white. Ore. Concerns In Ride Field. The Billboard, 27 Nov 1948.